Located in the centre of some of the Cape’s finest golf courses, makes 185 on BEACH the ideal base for you to enjoy golf to your heart’s content. Some guests stay a month or more to experience Arabella , Erinvale, Strand, De Zalze, Somerset West and the 9-hole Kleinmond Golf courses. 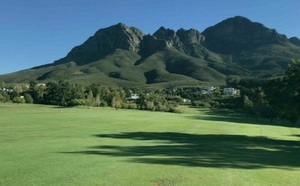 Further afield are Pearl Valley, Paarl, Stellenbosch, Devonvale and Hermanus. Then a massage and a laze around the pool – bliss! Blue-flag rated for cleanliness and safety Bikini Beach is just 200m away. Depending on the mood of the ocean the beach is sometimes stony, sometimes sandy. Sometimes the waves lap lazily and sometimes they break dramatically against the harbour breakwater. The water temperature is much warmer than the cold currents along the Cape Town Atlantic seaboard. Just beyond Bikini Beach is the ‘old harbour’ where luxury yachts and cruises rock. Enjoy a walk along the harbour wall where fishermen tend their rods patiently. Stormy seas and wild winds sometimes lash this area so be aware of danger. The harbour is home to the Naval Officers Academy. Refer to our restaurant section for advice. Beyond the Naval Academy are more pretty beaches. Along Sunset Beach Milkwood trees offer welcome shade and the shallow warmer rock pools make this ideal for young children. Extend your walk to the end of Main Beach and if adventurous (not at night) walk to Harbour Island at the other end of the dunes. The gentle trail winds along the mountain (no steep up and down). Drive: At Bikini Beach turn right; at the stop street (R44) turn left, then 1st right into Suikerbossie Rd; see sign near the end. First 20m up the hill not attractive. 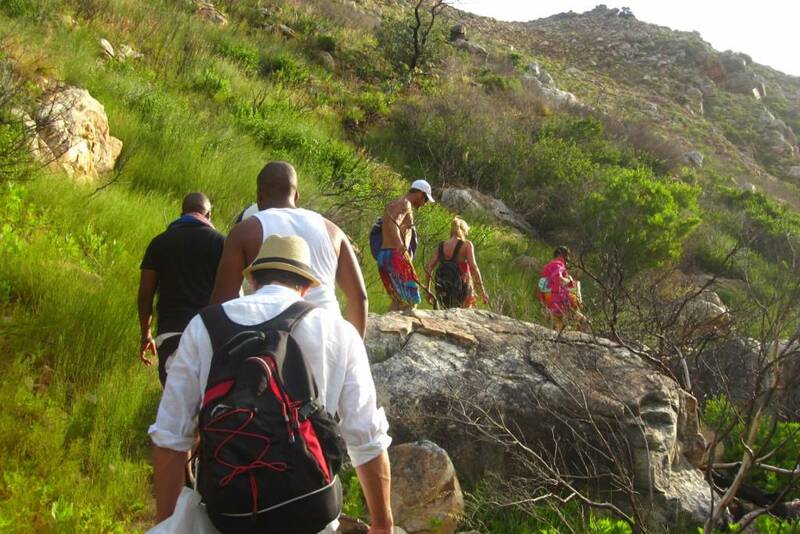 The trail, so close, is an excursion into the wild fynbos. Walk a while, then sit and enjoy nature and the view, then return to your car. Closed shoes are advised. One house away are stairs leading to upper Faure Rd. 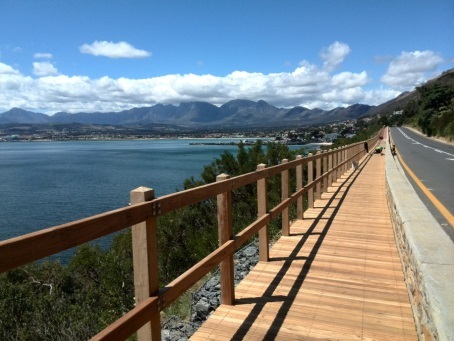 Keeping right leads you to this walk with fabulous views over False Bay. Walk safely as far as the Whale look-out point (Whale Season is July to about end November) and back – delightful! 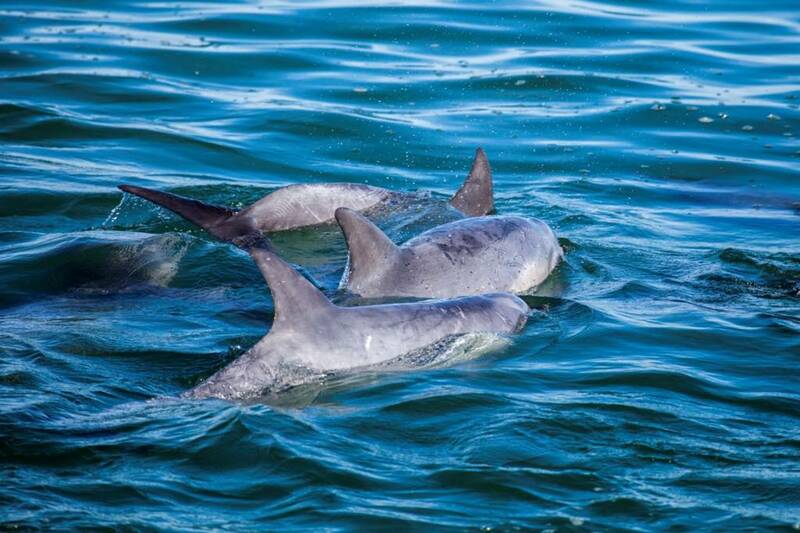 Occasionally dolphins come to Gordon’s Bay, even into Bikini Beach cove, about 200m from 185 on BEACH. See how they circle, trapping fish to sea gulls delight! Photo our guest Bill Davies from the Harbour wall. When the surf is up surfers rush, any day, any time to catch the big wave. 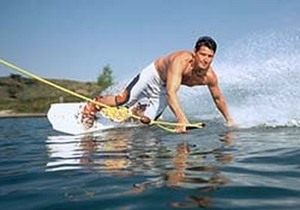 Enjoy their entertaining antics from your suite or the pool deck of 185 on BEACH. This superb photo was taken by one of our guests. 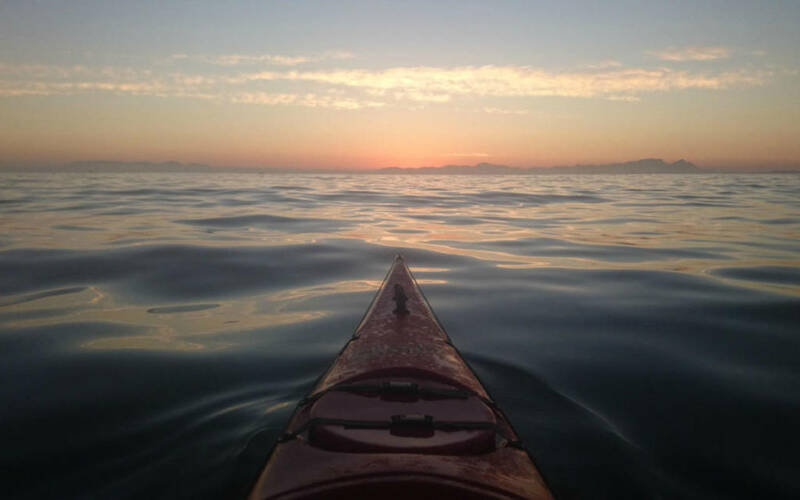 Allow Black Pearl Adventures to take you on a guided paddling tour into the (fairly) still waters of Gordon’s Bay or, for experienced paddlers, enjoy the challenge of the sea. 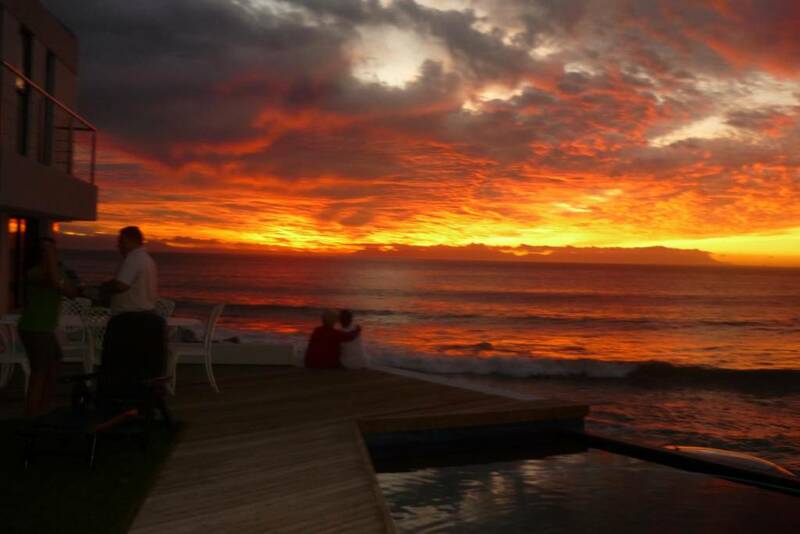 Gordon’s Bay sunsets are extraordinarily beautiful and every night is a different display! Make sure you get to 185 on BEACH by sunset, relax on your deck, sip your favourite beverage and wonder at the glorious beauty! 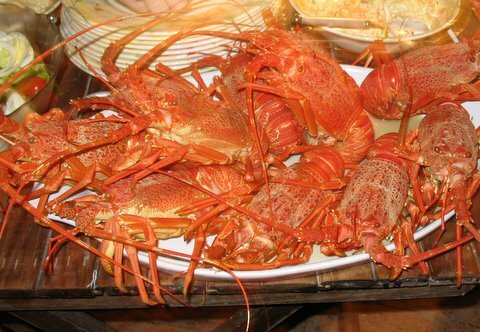 Especially recommended: ‘Thirsty Oyster Tavern’(relaxed atmosphere, superb seafood); ‘Zest’ (Delicious meals prepared with love); ‘Old Cape Café’ (excellent breakfast); The Strand: ‘Bens on the Beach’ (especially steaks); ‘De Brazzerie’ (Fine Dining). 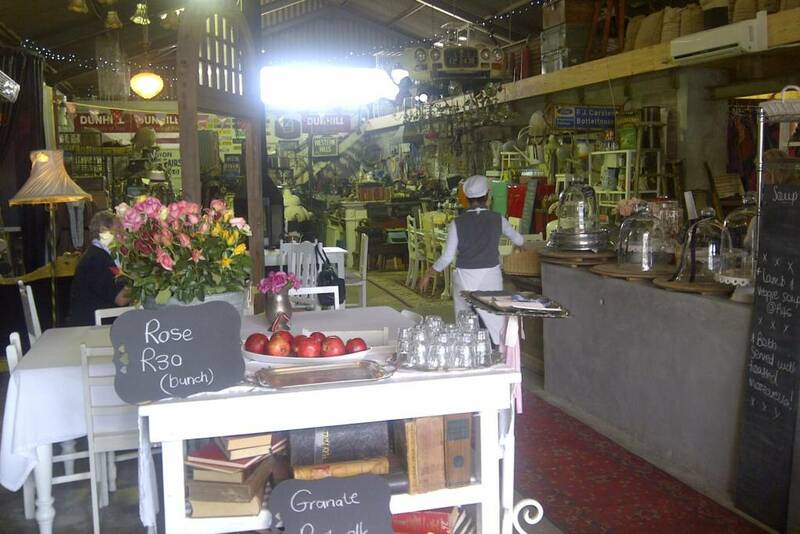 Award-winning ‘Pyjamas and Jam’-exceptional breakfast / lunch , extraordinary decor; and fish take-aways – ‘Ooskus’. … and the wine route! Never has healthy food tasted so delicious! Open for lunch Mon- Fri & Monday evenings, this fabulous restaurant, with a warm atmosphere and fantastic views, is just 200m up the hill from the ‘Checkers’ traffic lights. Try the delicacies from the Harvest Table – don’t miss out on the sauces! 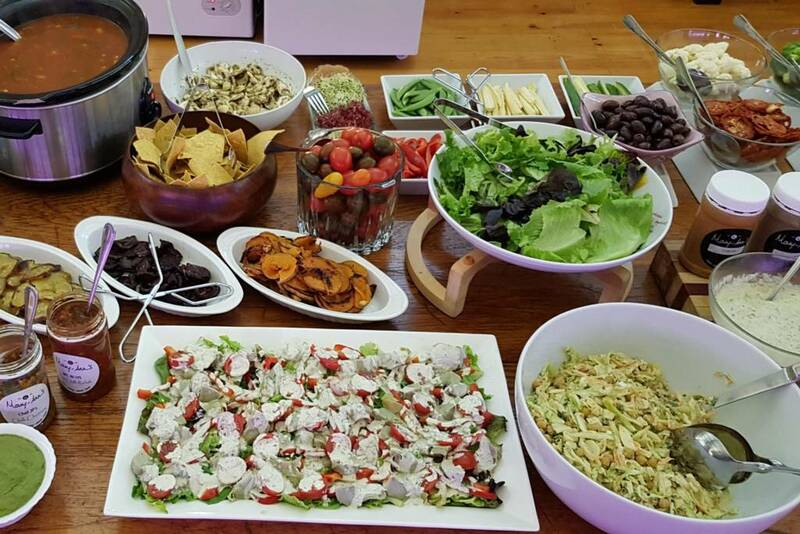 The health juices, deserts and snack food are SO delicious. Great for health advice. 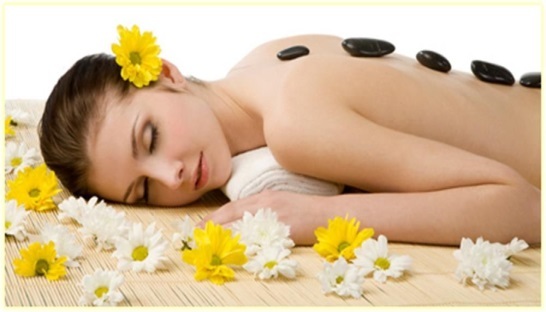 Quality massages and treatments at this superb spa have the most discerning guests complimenting. Try to stay awake so you can experience the blissful experience! 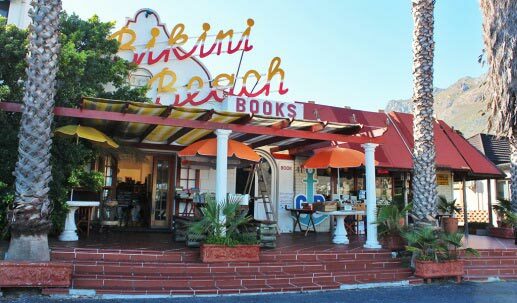 Leave our books at home because In Gordon’s Bay village is their famous Bikini Beach book shop. Be transported into a maze of books of every description. You can get lost in the amazing experience so, like Hansel and Gretel, have pebbles in your pocket to lead yourself out. Then laze around the pool or in your suite for a delicious read. 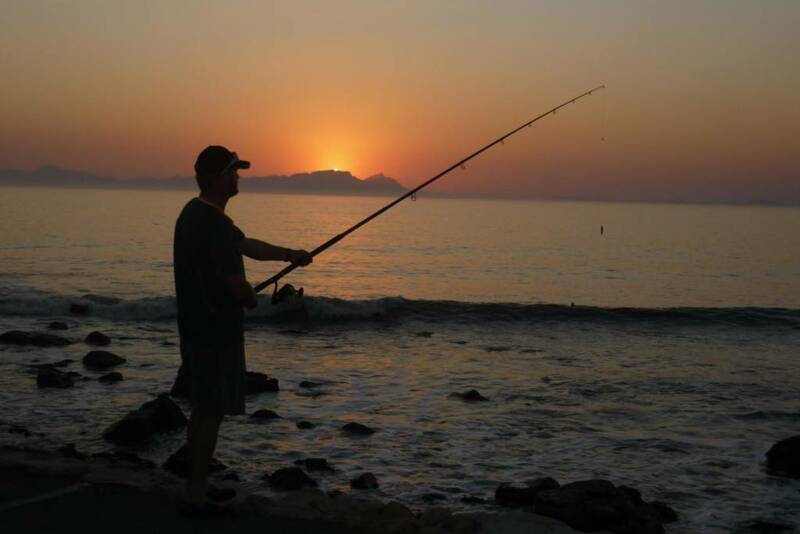 If you hanker for the thrill of Deep Sea Angling then contact the Gordon’s Bay Boat Angling Club to go on an adventure. 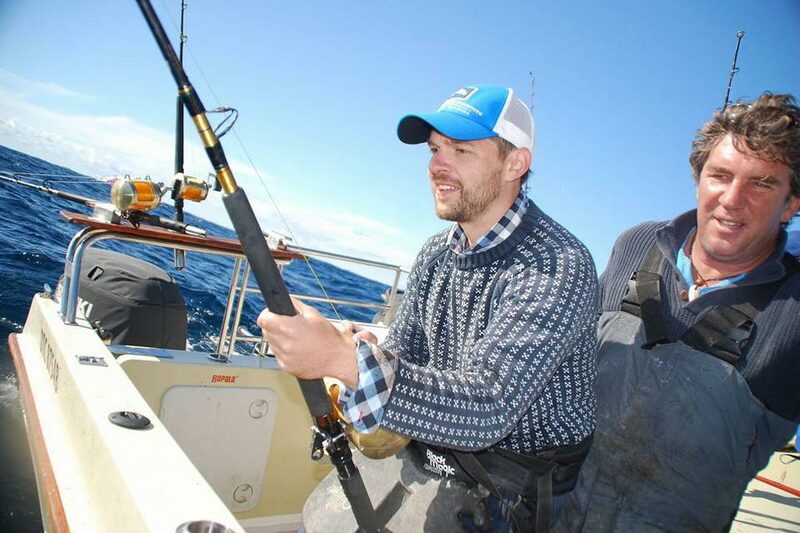 It is not uncommon for anglers to return with sizeable fish – among them tuna. Be sure to get the necessary permits. 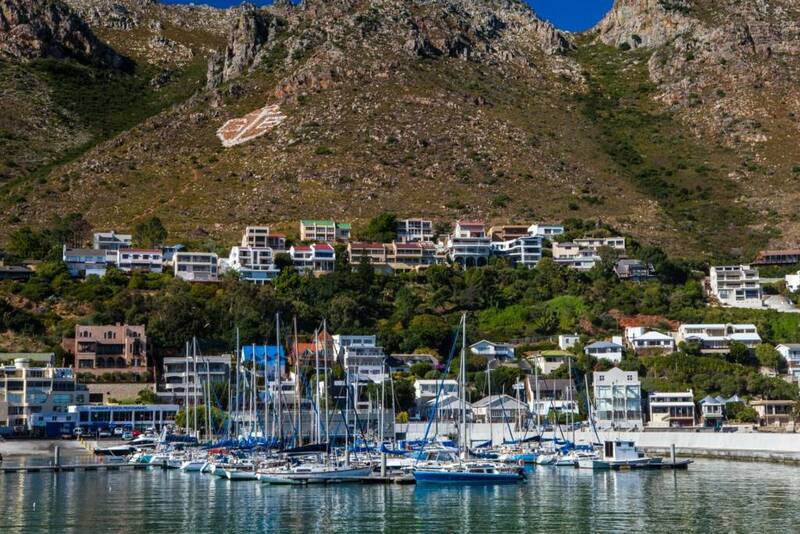 If you are a yachtman, sail the exciting route from Table Bay to moor at Blue Flag Harbour Island Marina or the Gordon’s Bay Yacht club, or with no berth, anchor in Bikini Beach Cove a 100m or so from the beach and enjoy basking in the sunshine , taking dips in the refreshing sea or sipping cocktails – the delights of your sport. 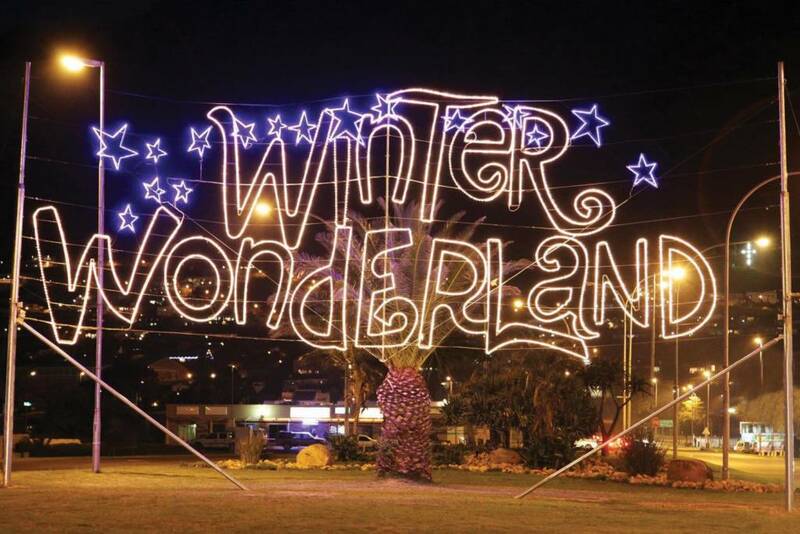 The quaint village of Gordon’s Bay comes alive with sparkling white LED lights for the Winter Wonderland Festival of Lights in celebration of the start of the winter school holidays. Buskers and entertainers ignite street parties as people stroll the beautiful beachfront arm in arm enjoying the sound of laughter. The Whale Route (Clarence Drive/ R44) is acclaimed as “the most beautiful drive in the world”. 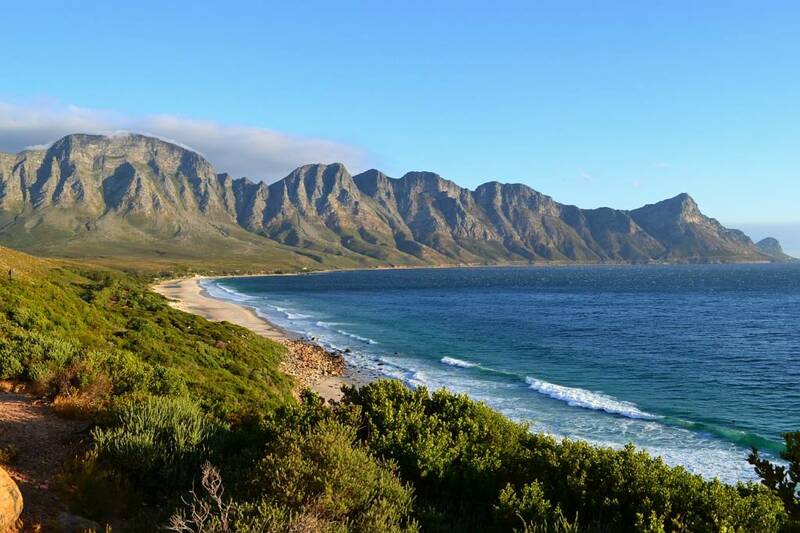 Enjoy spectacular views between Gordon’s Bay and Rooi Els. Pass Crystal Pools, stop often, especially where the road is close to Kogelbaai beach – stop to walk on this wild beach (not for swimming) or the hike trail nearby. 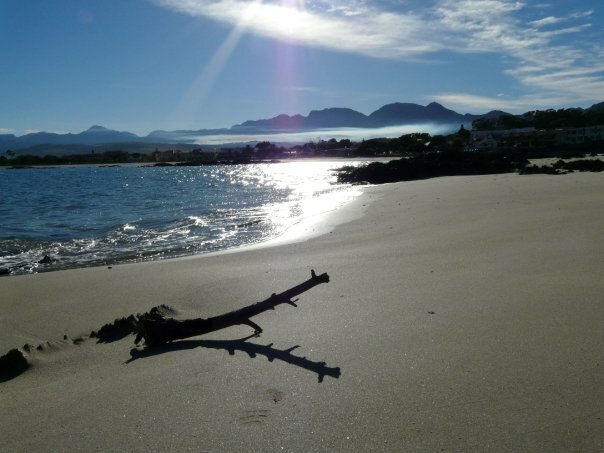 Pringle Bay, Betty’s Bay Kleinmond, and Arabella lead you on an hour’s journey to Hermanus. Enjoy magnificent views, especially at sunset or at night! At Bikini Beach turn right; at stop street R44, turn right; at last road before you leave Gordon’s Bay, see “Cape Town Water Works” sign – turn left & drive 5 minutes up winding road bordered by fynbos and spectacular views. 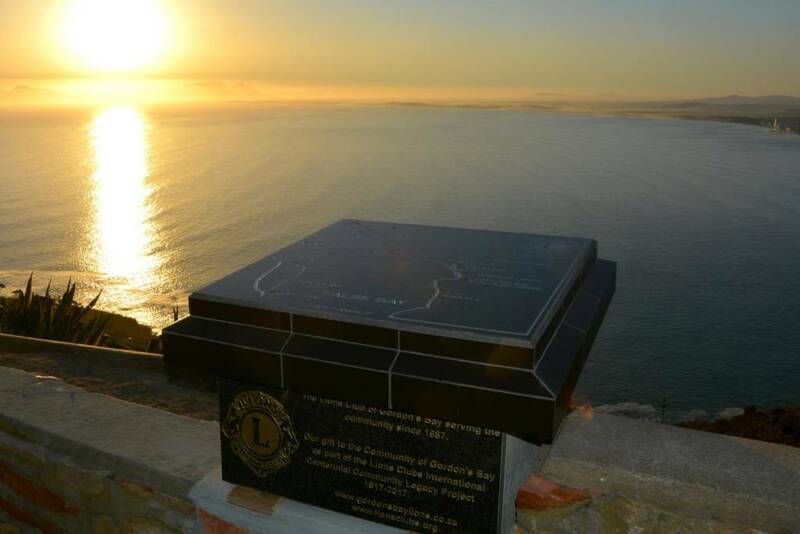 At the entrance of Steenbras dam (no entry) park and use the Lions granite slab to check directions of distant Cape villages. On the Whale Route watch out for the Penguin signs at Betty’s Bay – which lead you to the Stony Point Nature Reserve. Outside of this successful breeding colony you can see many pairs settle in their nests. 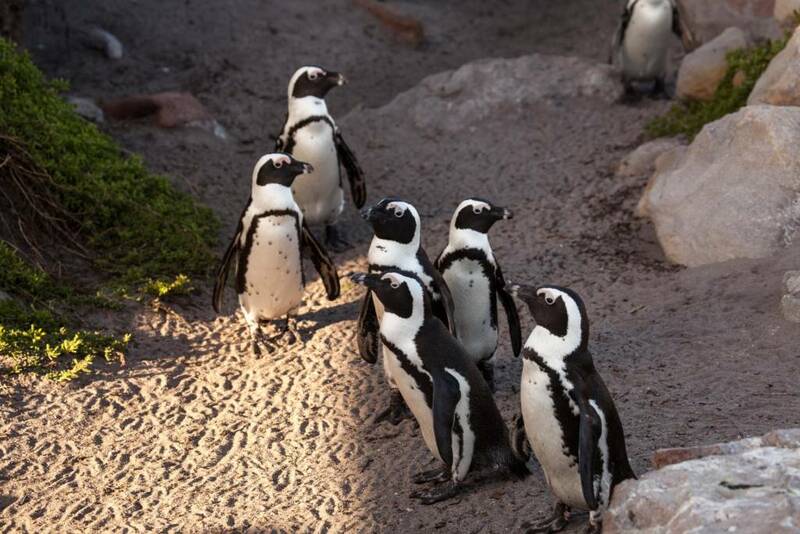 A small fee allows you onto the walkway to see more penguins and interesting facts displayed. 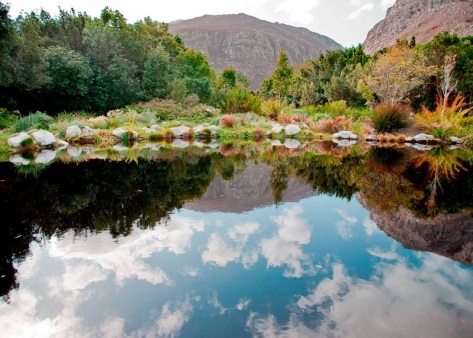 On the north of Betty’s Bay this exceptionally well-laid out facility displays many South African ecosystems – great for those interested in plants. At the deepest part of the gardens is a fabulous walk. Enjoy waterfalls and pools dressed with beautiful Cape plants. 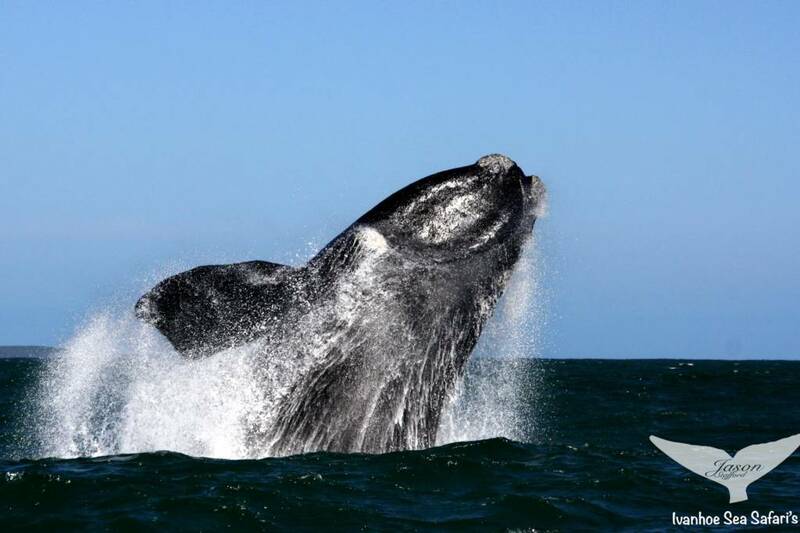 TripAdvisor winners, reputable and offering exceptional value and safety, Ivanhoe in Gansbaai offer whale viewing that make you feel you are on a Discovery Mission. See whales just meters away. Don’t miss this during whale season July to November! Incorporate this adventure into a day’s outing. 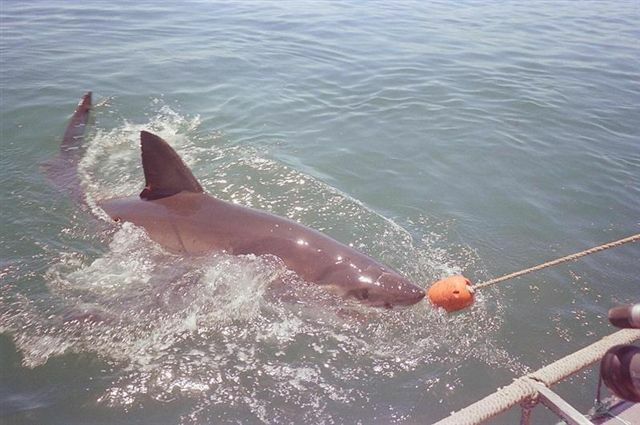 Being dunked in a cage while man-eating sharks swim around prodding the cage like the witch from Hansel and Gretel is some people’s idea of bliss! This one I have NOT yet tested myself! Ha! Ha! 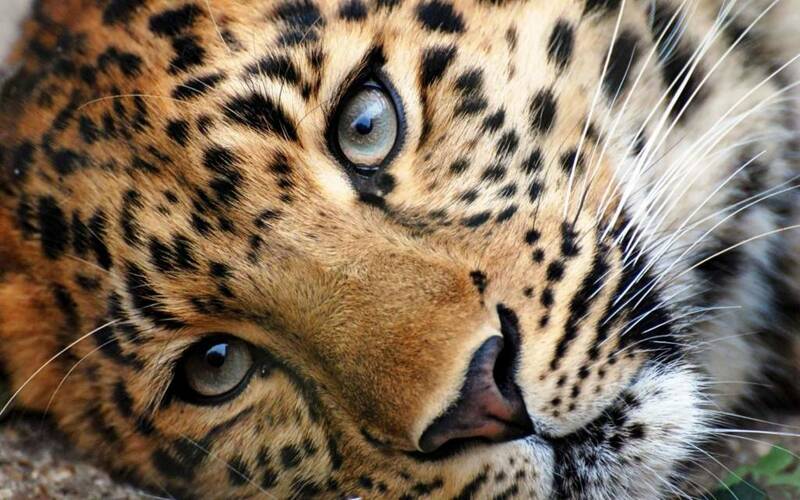 This ethical sanctuary for rescued wild big cats is where lions, tigers, leopards, black leopards and caracals can live their lives in safety. Educational visits are offered and guests are also told the heart-felt stories of each of these rescued cats. 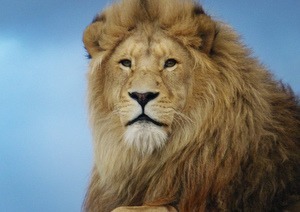 15 minutes from Hermanus this is a wonderful opportunity to see these magnificent animals so close by. 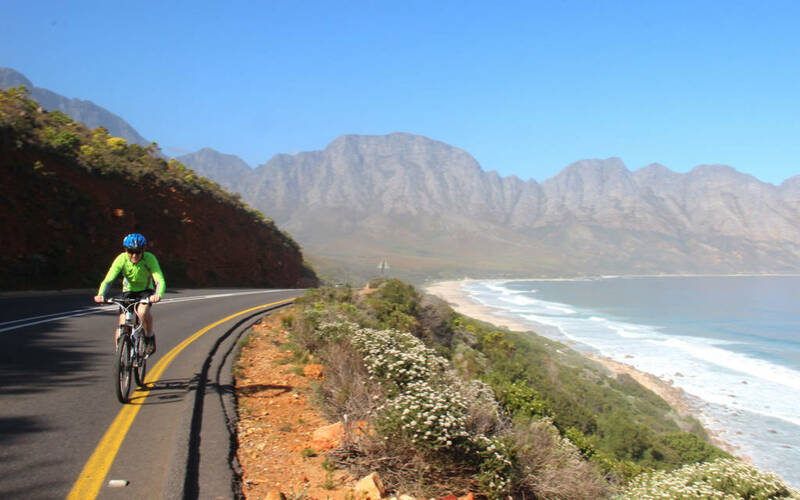 Spectacular rides along the Whale Route are a road bikers dream or try the challenge of the steep climb to the False Bay Look Out point. MTB Bike Tours offer exceptional service. 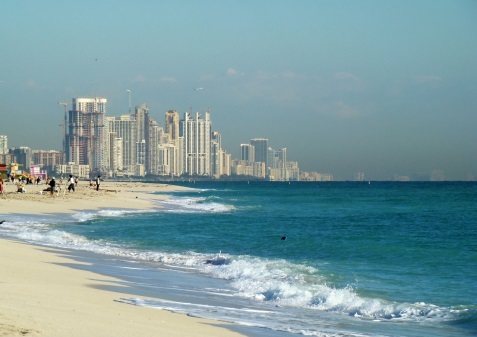 The long stretch of white sand makes this a lovely beach for a long relaxing walk. The shallow waters and gentle waves means the water is warmer, attracting many from far. 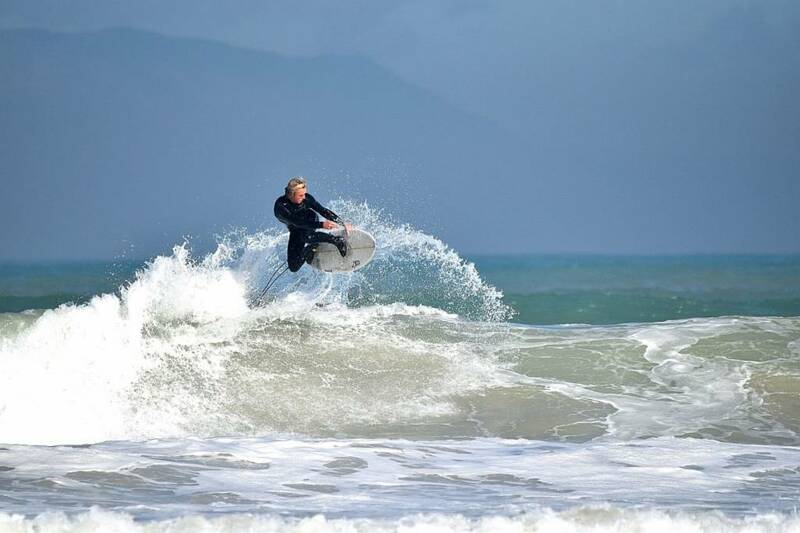 Windsurfers also challenge themselves and the waves. Although a restaurant, its extraordinary décor makes this an adventure. A block from Virgin Active on the N2, with an old helicopter on the roof(!) this award-winning restaurant offers stylish service with delicious food. Everything is tasty! As part of your Strand/Helderberg Adventure, or on your way to Cape Town or the airport, this is a memorable stop. On the Paardevlei property, close to Somerset Mall on the R44 near the N2 is this exceptional experience. Cheetah ‘Ambassadors’ too tame to release into the wild, offer you the opportunity to stroke these non-man-eaters, while you assist in supporting conserving these elegant creatures. Other interesting animals can also be seen. Those interested in animals – do not miss this! 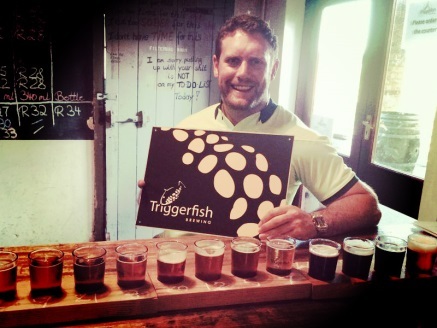 Also at Paardevlei – the same property as the Cheetah Outreach – is this stylish micro brewery. In a building filled with party character, it is fun to stop by and taste a few flavours of local beer. 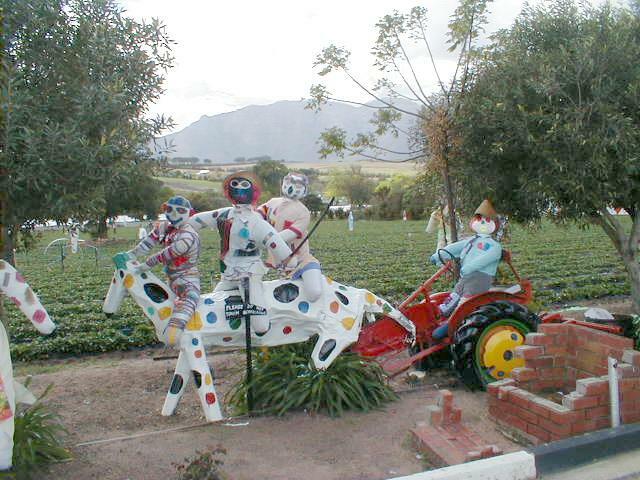 Deviate 5 minutes towards Stellenbosch on the R44 to visit the fabulous Mooiberge Strawberry Farm with its extraordinary ‘scarecrows’ in all shapes of animals welded and painted in bright colours – great for children (of all ages). Their farmstall is a feast of South African fare treats (try watermelon or green fig preserve with cheese) and its bottlestore comprehensive and well-priced. Pick strawberries on weekends or enjoy the Root 44 farmers’ market. 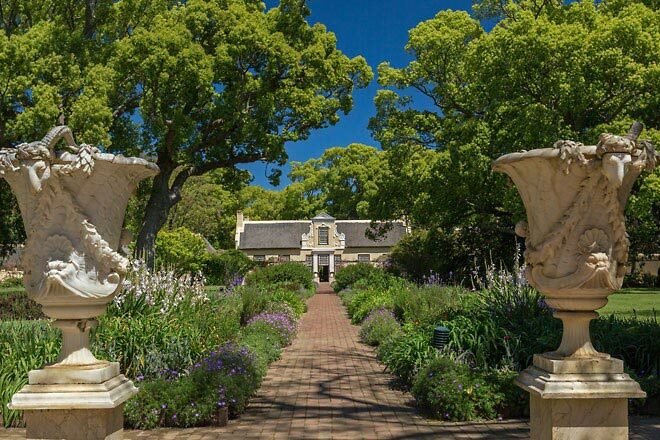 Just 20 minutes away, close to the Helderberg Nature Reserve in Somerset West are historic Vergelegen Wine Estate with massive Camphor trees, so old they are declared a national heritage and Morgenster Wine Estates and Lourensford, also offering markets on Friday evenings & Sundays and a South African Art Gallery. These contrast interestingly with modern Waterkloof Wine Farm offering award-winning fine dining, also Idiom Wine Estate. 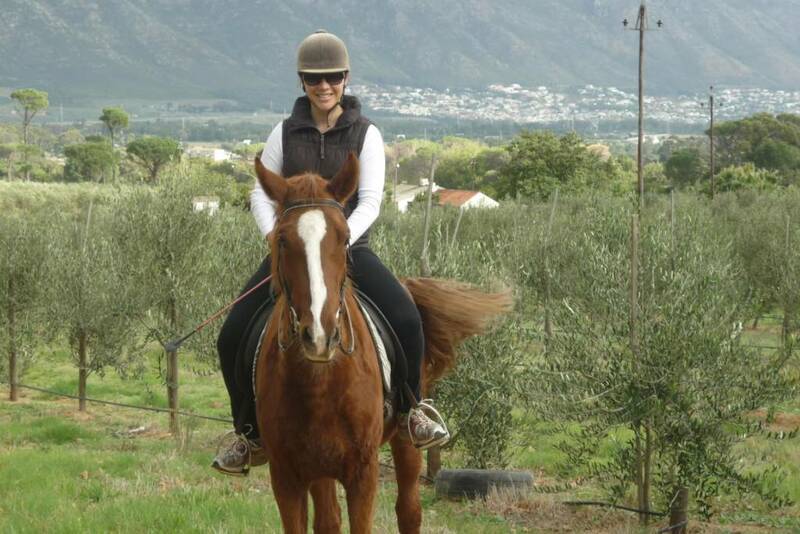 Just past the village of Sir Lowrys is Journey’s End Wine Farm where they also have quality, well-behaved horses. Guides are considerate of your fears and desires. 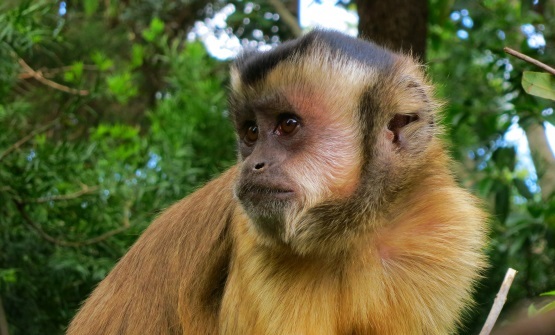 More than 28 species of primates and other creatures roam freely in this leafy park. Children especially enjoy this experience. Just off the N2, near the Sir Lowry intersection. For those who love adventure and the burst of adrenaline, this fun sporting activity will challenge you and get you hankering for more. At the intersection of the N2 and Sir Lowry’s Road it is just 15 minures away. 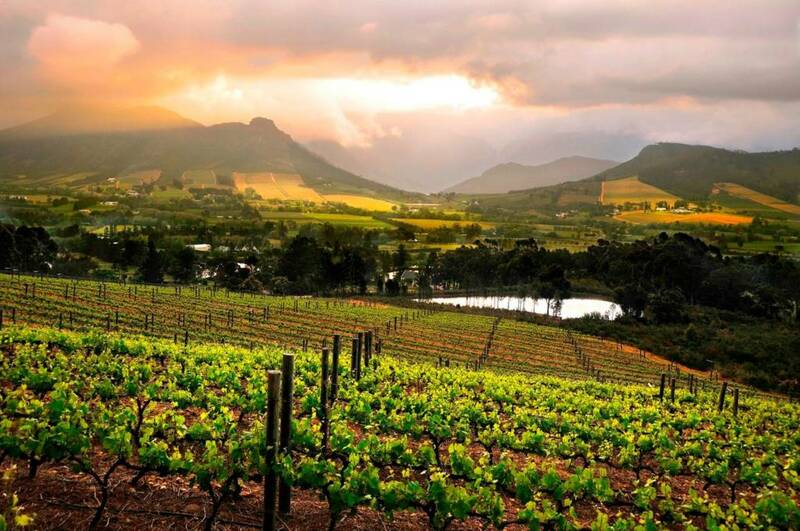 For magnificent vistas across orchards, nature reserves, mountain passes vineyards and mountains: Travel via Sir Lowry’s pass, Grabouw, the Huguenot Nature Reserve, the Franschhoek Pass to unique French-inspired Franschhoek. Adventure on the tram to several quality wine farms tasting wine and dining. Travel back via Helshoogte Pass, and Stellenbosch- Dorp Street, Church Street, Post Card Café, Mooiberge Strawberry Farm & its Root 44 market weekends. 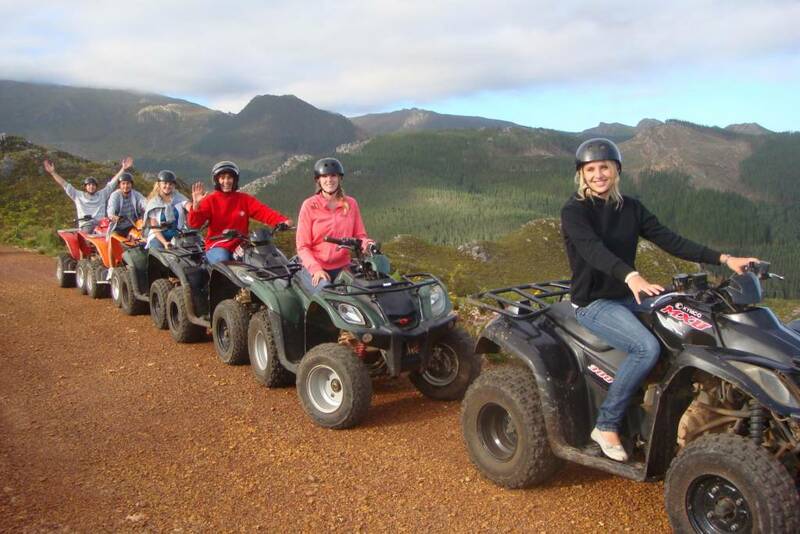 At a pace faster than a hike so you can enjoy more scenery but be close to nature, on quadbikikes you can weave your way through the spectacular Huguenot National Park, viewing forests, streams, mountians and spectacular vistas. 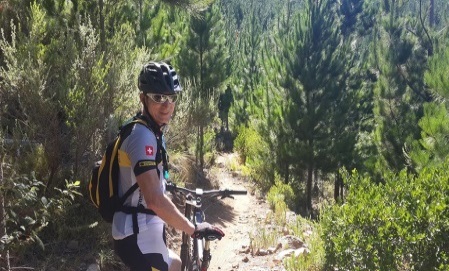 Your don’t need to be an expert to take to the bike trails through this magnificent scenery near Grabouw – orchards, vineyards, cows, mountains, streams forests – you will experience it all! MTB Bike Tours offer exceptional service. 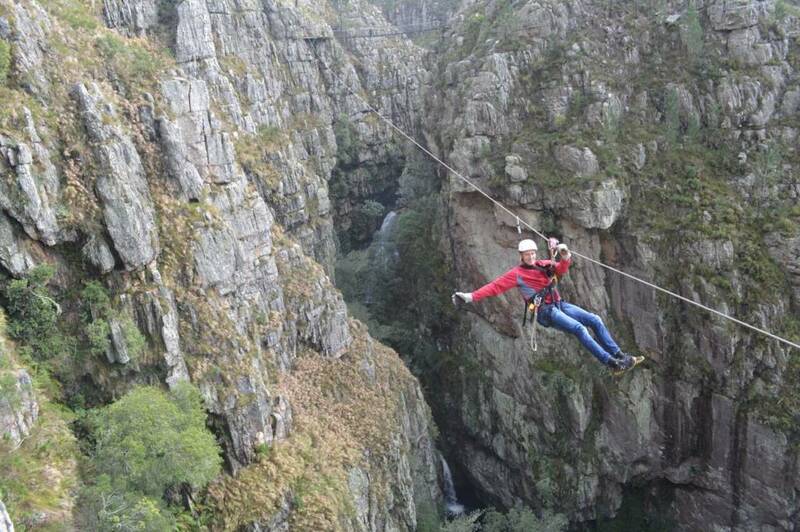 Slide safely to the opposite cliff over rivers, waterfalls and the most exquisite nature reserve! The longest ride is 330m – the most exciting experience! 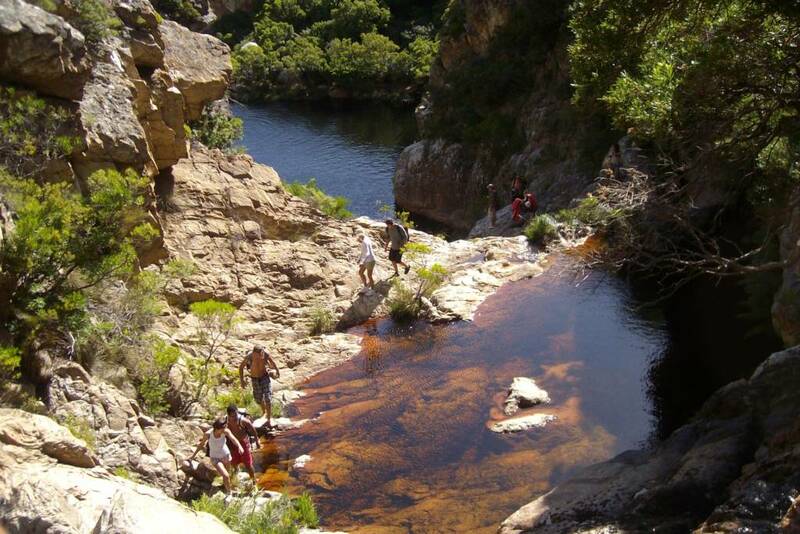 This 4-hour experience, is 20 minutes from 185 on BEACH, in the Hottentots Holland Nature Reserve. Walk about 1km through fynbos & see rocks sculptured by wind and rain. So beautiful it seems magical, this elegant dining restaurant in the heart of Stellenbosch winelands, should not be missed. 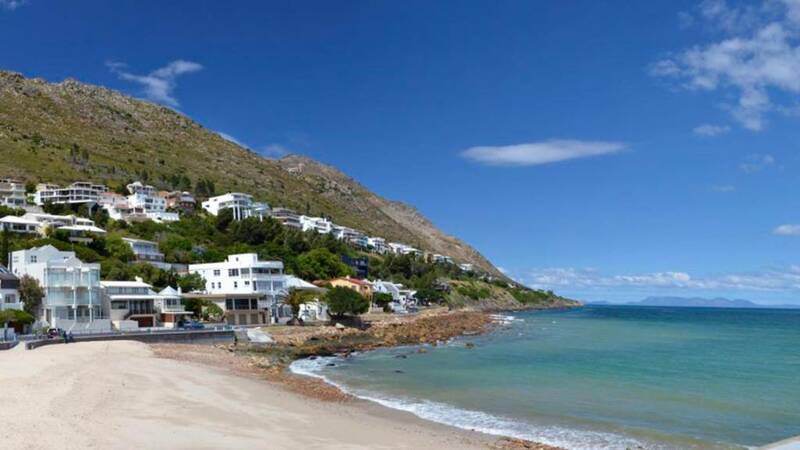 This is just a short list of things to do here in Gordon’s Bay. There is much more, for any taste and interest. Please speak to us if you want to know more. 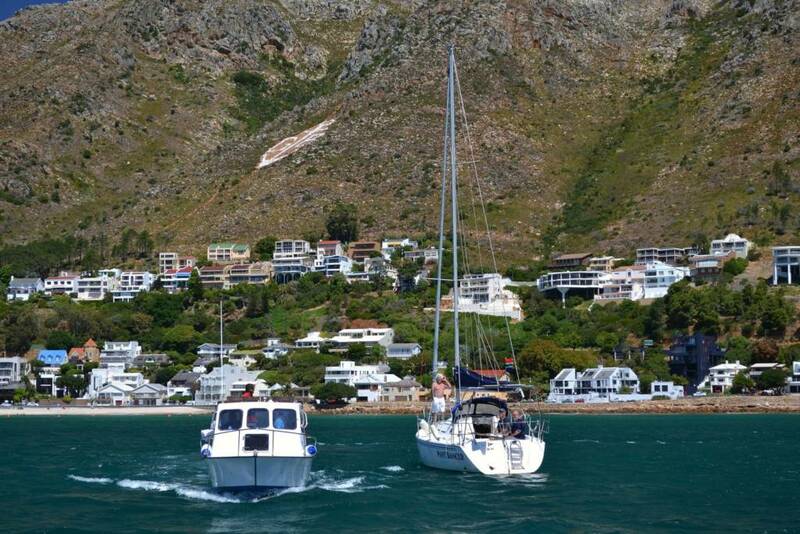 Or check out Cape Town Tourism for more things to do here in Gordon’s Bay.